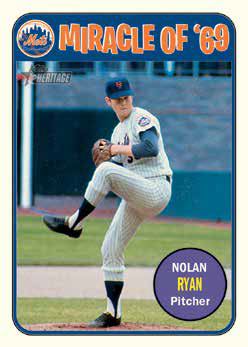 2018 Topps Heritage High Number Baseball is returning to the summer of ’69 one more time. Like any traded-style set, rookie call-ups and vets in new uniforms are a major focus. 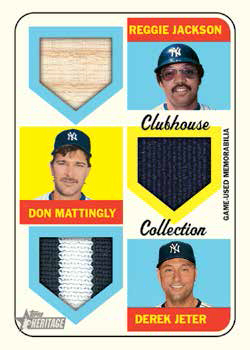 But there are also some new inserts branching out of the 1969 season itself. Like the main 2018 Topps Heritage Baseball release from earlier in the year, hobby boxes have either an autograph or a relic card. The main 2018 Topps Heritage High Number Baseball set has 225 cards. In it collectors will find cards of players finding themselves on new teams in 2018, either by trade or free agent signing. 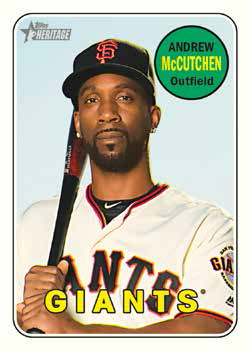 That means the first Heritage cards of Andrew McCutchen with the Giants, Eric Hosmer in a Padres uniform and Yu Darvish as a Cub. It also means a big focus on rookies making their debuts in the first part of 2018. Shohei Ohtani is part of the main set. He’s in 2018 Topps Heritage, but only with a variation short print and an autograph. 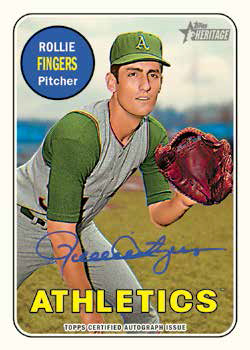 The design is based on 1969 Topps Baseball. Numbering for 2018 Topps Heritage High Number Baseball continues from where the first set left off, covering #501-725. The last 25 cards are short prints landing 1:3 packs. 2018 Topps Heritage High Number Baseball has a quartet of tough parallels. 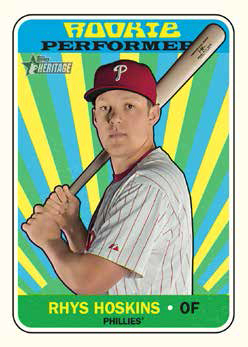 Although they’re not numbered, Topps has confirmed their print runs. These include: Black Border (50 copies each, hobby-only), 100th Anniversary (25 copies), Magenta Backs (ten copies), and Flip Stock (five copies, hobby-only), which reverse the feel of regular cards. When you touch a Flip Stock card, the fronts have the same feel and texture as regular cards do on the back. Mini cards (/100) and Chrome cards both return in High Number as well for select cards. Additional levels of Chrome parallels come in Refractors (/569), Black Border (/69), Gold Border (/5) and Superfractors (1/1). Purple Hot Box Refractors are in random hobby and retail value boxes. If you come across one of these hot boxes, you’ll find one Purple Refractor in each pack. 2018 Topps Heritage High Number variation short prints expand on those found in the original Heritage release. Action Image and Team Name Color Variations are only in hobby boxes. Other variations include Errors, Trade, Nicknames and Throwback Uniforms. 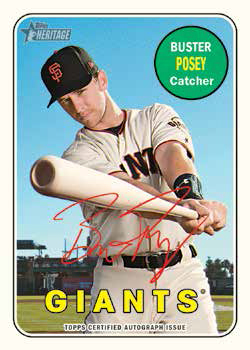 Real One Autographs continue to anchor the signature content in 2018 Topps Heritage High Number Baseball. These have on-card autographs from current and past players. As usual, collectors can expect to see some lesser names from the past on the checklist. This is a nod to the end of the 1960s and players appearing on their final cards in 1969. Special Edition Red Ink parallels come numbered to 69. Real One Dual Autographs (/25) are only in hobby packs. Despite having a pair of signatures, they’re still on-card. 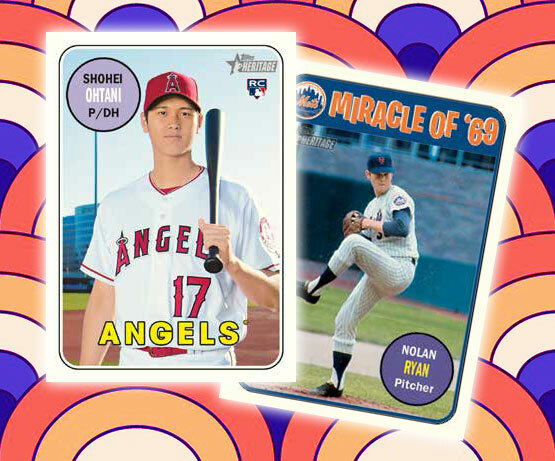 2018 Topps Heritage High Number Baseball pays tribute to the 1969 World Series Champions with Amazin’ Mets Autographs (/69). Signers were all part of the team. Like Real One Autographs, signatures are done directly on the card. Cut Signatures, which are all one-of-ones, come in a couple of forms. 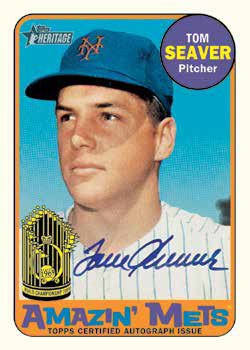 Baseball cuts consist only of players from the 1969 Topps set who have since passed away. Celebrity cuts draw from late ’60s pop culture. 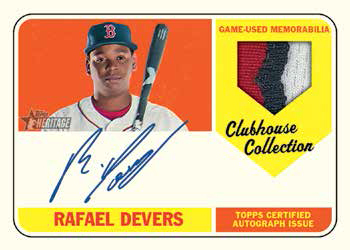 Clubhouse Collection Relics return as the main source of memorabilia cards. These have Gold (/99) and Patch (1/1) parallels. Multi-player cards come with swatches from two (/69), three (/25) and four (/10) players. These also have Patch (1/1) versions. Clubhouse Collection Autograph Relics (/25) bring an autograph into the mix. Dual-player version are only in hobby packs and have ten copies each. These all have on-card autographs and come Patch (1/1) parallels. 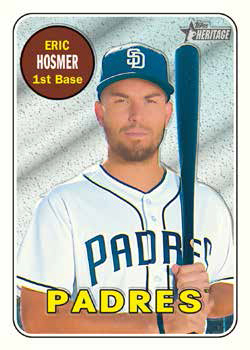 2018 Topps Heritage High Number Baseball has several additional insert sets. Some are a continuation from Topps Heritage while others are new. The World Series Champion Mets are the focus of Miracle of ’69. Cards look back at their postseason run and eventual World Series win over the Baltimore Orioles. 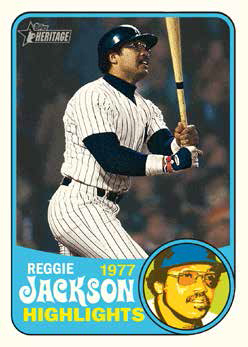 Reggie Jackson, who has his Rookie Card in 1969 Topps Baseball, gets a tribute set with Reggie Jackson Highlights. Exclusive to hobby packs, it’s a career-spanning look back at the Hall of Famer’s career. Autographs (/5) are also available. Other inserts include 1969 Deckle Edge, Now and Then, Rookie Performers, Award Winners and Combo Cards. Every 2018 Topps Heritage High Number Baseball hobby box comes with a bonus topper. These come in a couple of different forms. 1969 Topps Originals are buybacks from the original set that have been stamped to note they were included here. 1969 Bazooka Ad Panels are new cards that use the design of the original.